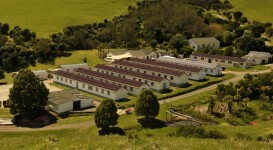 New Zealand’s largest off-grid solar power installation at Motutapu Island Outdoor Education camp, operated near Auckland by the Dept. of Conservation. Cölbe/Germany and Auckland/NZ, January 2011. In 2010 Auckland based „Power Technology“, a Wagner Solar Group Partner, installed New Zealand’s largest off-grid solar power system on the Island of Motutapu in the Hauraki Gulf. The New Zealand Dept. of conservation contracted the planning and installation of a large scale off-grid photovoltaic installation with the Auckland based renewable energy company „Power Technology“. The provided electricity is supplied to a DOC Field Centre with 11 houses with variable occupancy rates (staff and contractors) as well as the Motutapu Outdoor Education Camp that is visited by 45,000 children annually. Telecommunications towers by Vodafone and Telecom and Motutapu Farms Ltd. also rely on the electricity produced locally on the Island. In addition to that the supply with potable water on the island is by electric pumps. The installed PV system covers approximately 50% of the electric load on Motutapu Island and hence significantly reduces fuel consumption of the local diesel generators and the related considerable environmental risks from water borne diesel transportation. Durable German made Schott polycrystalline solar panels with a total power rating of 60 kW/p generate the solar electricity which is fed to the island’s pre-existing AC grid. The Wagner Solar Group delivered 12 high quality SMA Sunny Island grid forming Battery inverters from Germany, which Power Technology installed in a multi cluster combined with 4 banks of sealed Exide Technology solar batteries with a total of 12,000-amp/hr storage capacity. The design allows for secure uninterrupted power supply to the AC loads that are connected to the island’s existing AC-grid. The grid draws its power from the AC coupled solar or battery power or auxiliary power from diesel generators, as needed. Photovoltaic inverters from Enasolar (New Zealand made) track the grid formed by the battery inverters, allowing the power from the panels to be smothly delivered to the grid. The advantages of the solar energy supported Island grid are many, and last but not least it turns out to be an economically attractive solution: thanks to reduced service requirements for the Diesel generators and due to the high fuel costs, the overall cost per kw/h was reduced. As Power Technology Manager Hamish Littin reports, the solar power generated on Motutapu valued at no less than NZ$ 16,572.20 during its first month of operation alone, proving that green technology duly can be economical!